The Griya Villas and Spa aims at becoming a highly environmental conscious resort. From early stages of operation, our goal has been to create an environmentally friendly Master Plan in accordance with international environmental standards. Our goal is to be as carbon neutral resort as possible, yet still maintaining the highest level of luxury standard for our guests. Straws: Plastic straws are one of the worse inventions ever, for the environment; they are being used only once, for just a few minutes and many end up on the beaches and the oceans. At The Griya, we are very proud to have already completely eliminated plastic straws from our resort and we now use glass straws and alternative straws; our glass straws are very successful with our guests and are also available for sale in our Boutique. This waste management will involve training our entire Staff to teach them how to properly sort waste and help them gain insights and awareness about the disastrous damages of burning or burying plastic, two habits that are sadly, still very much present here in Bali. Our goal is also to show our Staff that there is value in the trash: overwhelming research shows that over 90% of our waste is totally recyclable and reusable. We will invite or Teams to attend Eco-brick workshops (Learn more about eco-bricks @ www.ecobricks.org) organized by Peduli Alam so they can learn how to responsibly get rid of their trash, all the while helping their beautiful island stay green and clean. Our Purchasing Team will collaborate with Peduli Alam so identify ways in which we can choose and buy our every day supplies in a more sustainable way. 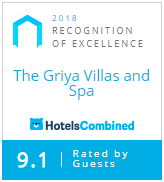 The Griya Villas and Spa will also continuously create programs to educate the local community to increase their awareness of environmental pollution, to save their prestigious reefs and to help them to create waste free environment for living.